Supply Chain Balanced Scorecard for Excel is designed to help in measuring and controlling company delivery service and associated aspects. This metrics set will help to measure the performance of manufacturing, warehouse and delivery from various viewpoints, including customer satisfaction and financial, giving key manager key performance indicators for supply chain business unit. 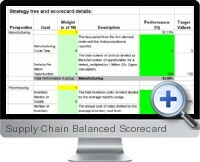 The Supply Chain Balanced Scorecard metric pack includes such KPI (Key Performance Indicators) such as Defects Per Million Opportunities, Inventory Months of Supply, Claims percentage for freight costs, On-time pickups, Transit time, On Time Line Count, Customer Order Promised Cycle Time, providing a flexible way to improve supply chain unit performance.